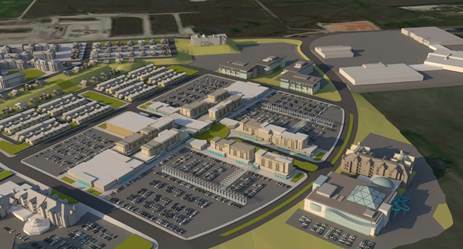 North Dakota’s premier mixed-use development, Williston Crossing, is moving full steam ahead. The Williams County Board of County Commissioners today granted entitlement for the development by a vote of three to two. Stropiq, Inc., the international real estate principals behind the ambitious retail-driven project will now move forward into the pre-leasing stage. Stropiq, Inc. and its advisor JLL, plan to gauge and secure retailer interest as part of the next phase of the project at the upcoming International Council of Shopping Centers Real Estate Conference in Las Vegas in May. The first phase of the development is slated to include 350,000 square feet of retail space, which would ideally include a theater, restaurants and retail stores. Stropiq expects to break ground on the project as early as 2016. Subsequent phases of the development will be based on growth and demand, but at completion Williston Crossing is expected to encompass approximately one million square feet of retail and entertainment, plus a hotel and waterpark space, with a mix of office and multifamily options. According to a recent survey conducted by JLL and Stropiq of Williams County and City of Williston residents, nearly 96 percent of respondents indicated that region doesn’t have enough retail options to satisfy their needs. When asked how respondents feel about Williston Crossing being built in in their community, nearly 78 percent said “thrilled,” with nearly 85 percent indicating they believe the Williston Crossing project will improve their quality of life. Categories: Agency Leasing, Americas Retail, Development and tagged JLL, North Dakota, retail, Stropiq, Williston, Williston Crossing.